After being called to the Cardinalate by Pope Clement VIII, Robert Bellarmine, one of only two Jesuit Doctors of the Church, found need for a reprieve from what were often tiresome temporal duties. 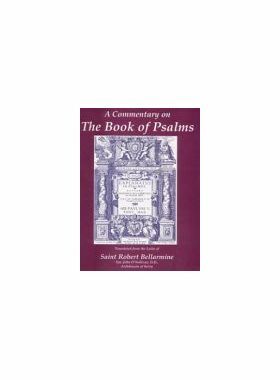 Therefore, to exhaust his intellectual and devotional energies in writing, he prepared for posterity his very own commentary on each of the Psalms. 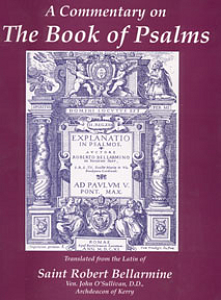 Most of the Psalms of David, he said, read like a compendium of the whole of the Old Testament, a summation in poetic capsule. Others (Ps. 2, 21, 44 & 60) speak so clearly of Christ that they seem rather to belong to the Gospels. Yet, it is not the royal prophet, rather, it is the Holy Ghost, the true Author, Who desires to pluck this ten-stringed instrument of beauty called the Psaltery and bring our hearts to tears or jubilation as we sing praise to the Most High. This is a huge book of nearly four hundred pages, a spiritual goldmine. The vain efforts of persecutors against Christ and his Church. 1 Why, O Lord, are they multiplied that afflict me? Many are they who rise up against me. 3 But thou, O Lord, art my protector, my glory, and the lifter up of my head. 5 I have slept and have taken my rest: and I have risen up, because the Lord hath protected me. 6 I will not fear thousands of the people surrounding me: arise, O Lord; save me, O my God. 1 “Why, O Lord, are they multiplied that afflict me? Many are they who rise up against me.” David, addressing himself in prayer to God, complains of and wonders at the number of his enemies, for, as we read in 2 Kings 15, “All Israel was then most cordially following Absalom.” Such was the case with Christ, especially in his passion, for then his son, that is, his people, rebelled against him, crying out: “we have no king but Caesar;” and he, like a sick man and a fugitive, was obliged to fly from them through his death; but speedily returned through his resurrection. Absalom signifies the peace of the father, because, in fact, it was the son only that stirred up the war; but the father was always at peace, both as regards David, who wept at the death of his son, and as regards Christ, who prayed for his persecutors; and as Achitophel, the intimate friend and counselor of David, was the person to betray him in the rebellion of his son, and afterwards hanged himself, similar was the end of Judas, one of Christ’s most familiar friends, who also hanged himself. 3 “But thou, O Lord, art my protector, my glory, and the lifter up of my head.” What one in trouble, a just man such as David, and especially what Christ, the head of all the just, would say. The meaning is, many tell me I put my hope in God to no purpose; but they are quite mistaken, for you, Lord, never desert those that confide in thee; therefore you are “my protector,” to ward off the weapons of my enemies, not content with which you become ‘‘my glory,” that is to say, the cause of my glory. Hence it arises that you come to be “the lifter up of my head;” that is to say, you make me, who a while ago hung my head in grief and sorrow, hold it up now in joy and exultation. 4 “I have cried to the Lord with my voice: and he hath heard me from his holy hill.” A proof of David’s confidence. He appealed to the Almighty, and, at once, he was heard. Observe the expression, “I have cried with my voice;” as much as to say, not silently, indifferently, or passively, but loudly, emphatically. “From his holy hill,” means either Sion, or, more probably, the kingdom of heaven. 5 “I have slept and have taken my rest: and I have risen up, because the Lord hath protected me.” In the persecution of Absalom David made no resistance, but lay down as one would to sleep, but soon after awoke, strengthened by the Lord to recover his kingdom, “because the Lord hath protected” him. 6 “I will not fear thousands of the people, surrounding me: arise, O Lord; save me, O my God.” Clearly applicable to David, who, on recovering courage, rose up and got ready to meet his enemies; and, therefore, now exclaims he has no fear of the countless enemy, confiding, as he does, not in his own power, or the arms of his allies, but in God; and he therefore supplicates him to rise and save him from the hands of the enemy. Observe the connection between the word “arise,” in this verse, and “I have risen,” in the preceding, as much as to say, I have on your inspiration arisen, and do you now at my request arise in my defense. 7 “For thou hast struck all them who are my adversaries without cause: thou hast broken the teeth of sinners.” An acknowledgment of the divine protection, and his deliverance from his enemies, whose teeth were so broken that, though they may bark, they could not possibly injure or bite. 8 “Salvation is of the Lord: and thy blessing is upon thy people.” An invocation of the divine blessing, and thanksgiving for the benefits conferred by him.